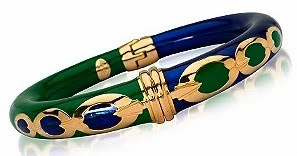 NY Spender: Looking for an enamel bracelet? 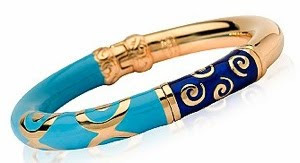 Looking for an enamel bracelet? I love love love Jean Schlumberger for Tiffany! And who doesn't? Ross Simons Set of 4! $64!!! 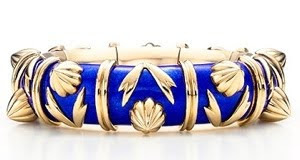 L LOVE enamel! JS does beautiful work, doesn't he? I took an enamel course once - will have to incorporate that into my fine silver work, down the road. Ross-Simons does have nice "compromise" pieces - good value. 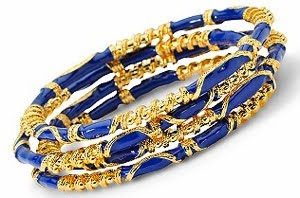 The bracelets are very nice. However enamel? Are they easily broken? Women in my family have worn jade bracelets, only a few of them (the braclets) are still intact. The shattered ones were fused back with gold, I believe. It was Dorothy Parker, deadly with words, who said that in response to Clare Booth Luce's provocation "Age before beauty."